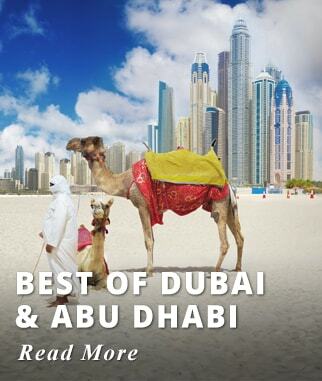 Discover the best that the UAE has to offer. From Abu Dhabi the famous Capital of the United Arab Emirates to the sites of the well renowned City of Dubai. 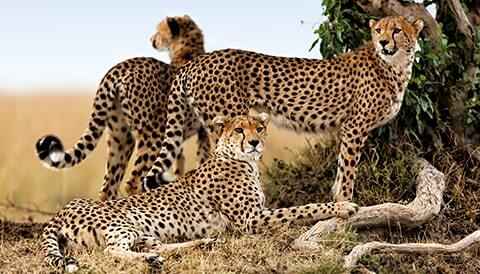 This itinerary also includes a stay in Oman a Country known for its majestic natural beauty. Tour the Main Tourist Sites in Abu Dhabi such as the Sheik Zayed Grand Mosque, The Corniche, The Emirates Palace, and the famous Ferrari World. 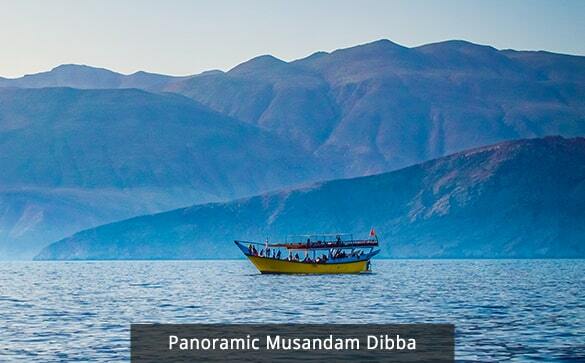 In Oman, discover the mesmerizing natural beauty of this Country on your day trip to Musandam Dibba. 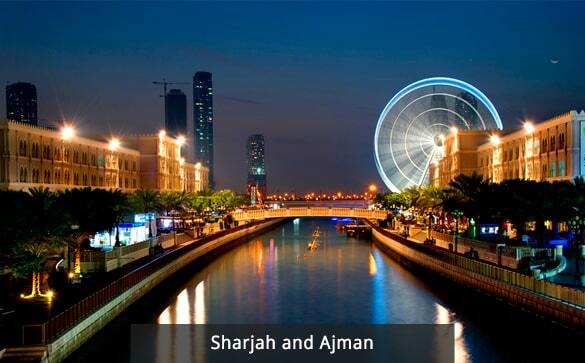 Your itinerary also includes stops to visit the Cities of Sharjah and Ajman in the Northern part of the UAE. 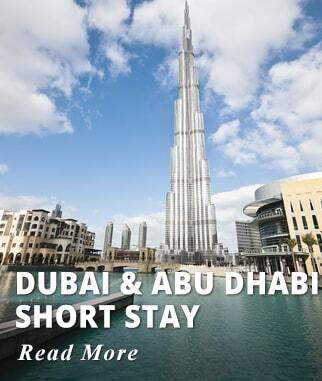 End your trip with Four nights in Dubai. Visit the most well-known tourist sites of this cosmopolitan City as such the famous Burj Khalifa; Entrance to the 124 floor is included. There is also a desert excursion with Dinner where you will experience the authentic Arabian culture and an evening Dhow Cruise with Dinner. Our packages include flights, accommodations with breakfast, all transfers, entrance fees, and all taxes (except tourist fee paid locally), there are no hidden costs. Departures are guaranteed with flexible departure dates. Daily departures through 2019 until November 30, 2019. Price is based on limited seat availability Weekend surcharge $90 USD. Prices are higher for Summer/Christmas/New Year/Easter Departures. Prices are per person based on two adults sharing the room. A supplement USD 999 or CAD 1339 applies to passengers traveling alone. 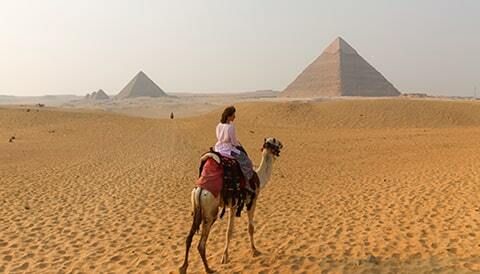 Sail the Nile aboard a River Cruise, Includes off-shore excursions to visit Egypt's famous antiquities along the Nile. 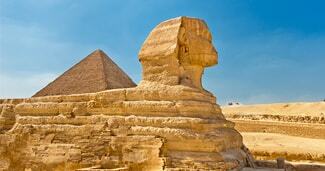 Visit the Pyramids, Sphinx and the Egyptian Museum. Board your International flight to Dubai; we offer departures from most major Cities from the USA and Canada. After Customs and immigration meet our representative, who will assist you with transfer to your Hotel in Abu Dhabi. Accommodation: Ramada Corniche, Wyndham Hotel or Similar. Activities included today: Arrival in Dubai. Transfer by road to Abu Dhabi. After breakfast join your Guide for your Abu Dhabi City Tour. See how the capital city of the United Arab Emirates merges its rich ancient heritage with modern contemporary life. This tour package has been carefully crafted to include the highlights of Abu Dhabi for a memorable experience for each. Witness some of the most majestic landmarks of the UAE! 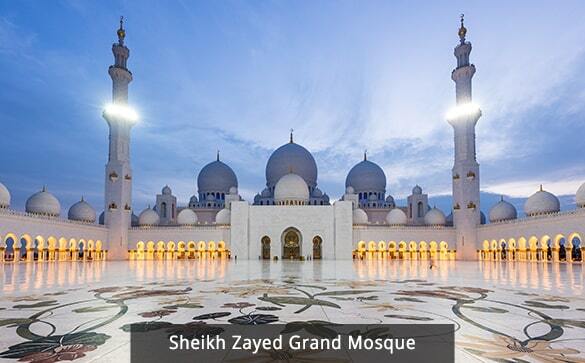 A historical monument on route to the Abu Dhabi city centre is the astounding grand, white Sheik Zayed Grand Mosque. It was named to honour the late president, His Highness Sheikh Zayed bin Sultan Al Nahyan. 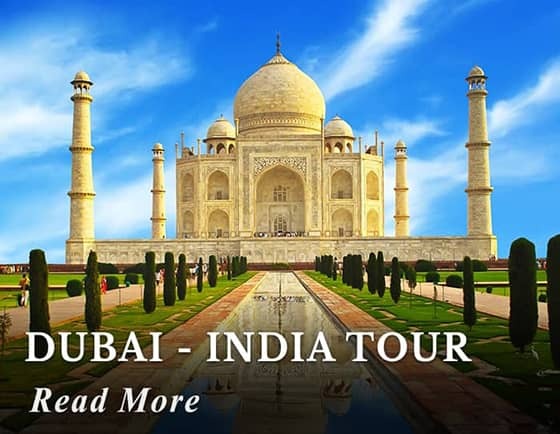 The tour will then take you to attractions such as the stunning Emirates Palace, the bustling Abu Dhabi city centre and down the exquisite Corniche, showcasing an impeccably manicured setting, with cafes, restaurants, and children's play areas. 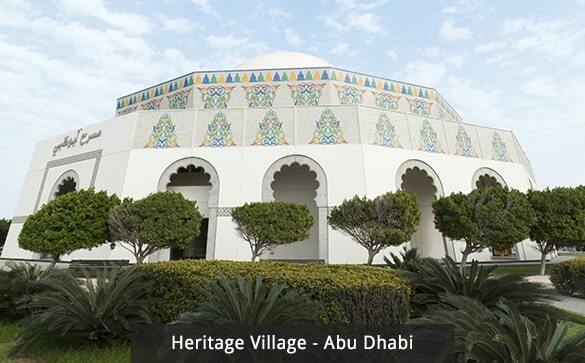 Explore the Heritage Village and the Abu Dhabi Museum, a window through the region's past. The trip terminates with a visit to Abu Dhabi Marina Mall, filled with retail outlets selling unique, well-known and luxury items. Activities included today: Abu Dhabi City Tour. After breakfast, head to Ferrari World, Yas Island, Abu Dhabi's most modern attraction. Ferrari World Abu Dhabi is an amusement park on Yas Island in Abu Dhabi, United Arab Emirates. 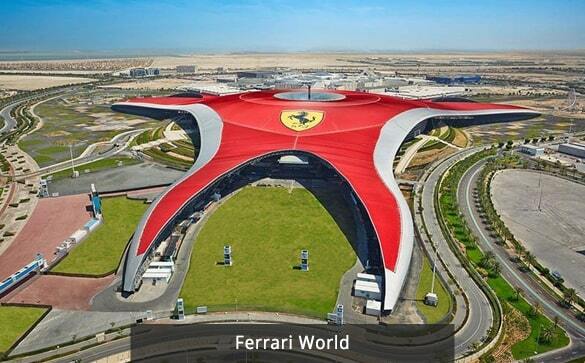 It is the first Ferrari-branded theme park and has the record for the most massive space frame structure ever built. Experience over 20 state-of-the-art attractions and the world's fastest roller coaster: Formula Rossa – make your dream a reality by driving a Ferrari in the driver experience. Change pace with the more relaxed tour of miniature Italy aboard Bell'Ítalia or a Ferrari factory tour at Made in Maranello. Italian dining and cafe delicacies are available throughout. Activities included today: Visit Ferrari World. Bronze tickets included (regular general admission). Check out of the hotel after breakfast and head to Oman. 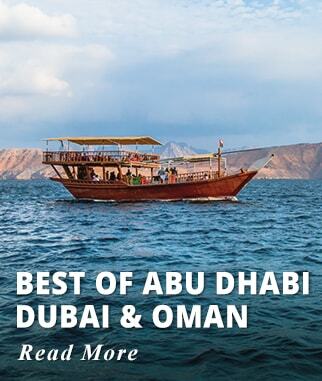 Experience some of the most scenic regions including the UAE's Northern Emirates, Umm Al Quwain, and Ras Al Khaimah. Upon arrival check in and relax at your hotel. Accommodation: Golden Tulip Hotel or Similar. 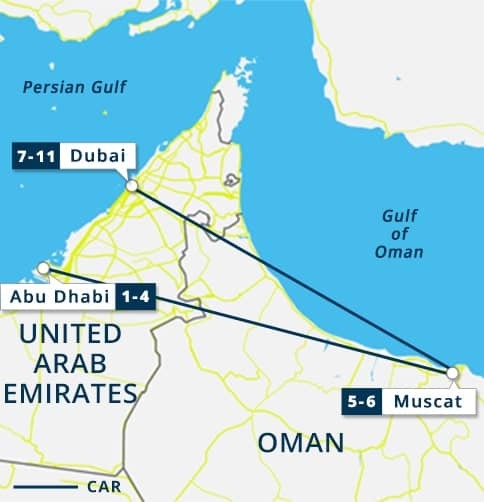 Activities included today: Travel by Road approximately three hours from Abu Dhabi to Oman. 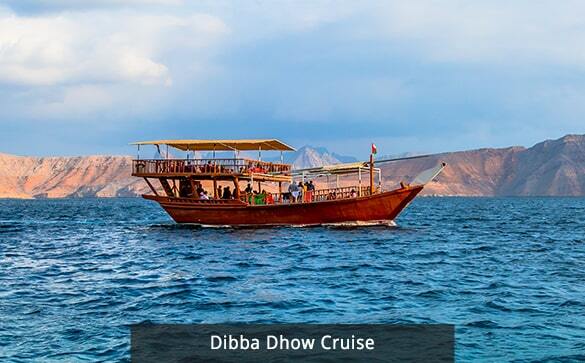 After breakfast, get the day started on the famous Dibba Dhow Cruise. Discover the Arabian world on a mesmerizing trip to Panoramic Musandam Dibba. A haven for nature lovers, its majestic landscape with crystal clear, towering mountain range, jagged coastline and clear climate will leave you awestruck. As the Boat drifts along the fjords in glorious sunshine, escape into a world of peace and beauty flanked by mountains. If you're a water sports aficionado, try a range of exhilarating water sports including banana boating, fishing, or plummeting into the emerald green waters to swim or snorkel and take in the diversity of exuberant the underwater world. After all, the water of Musandam is a sanctuary for an incredible range of fish, as well as other marine life. Besides a Continental buffet lunch, refreshments and snacks will be provided; in the summer, we advise lightweight clothing/swimwear, while sweaters and jackets are recommended during the winter. Activities included today: Trip to Musandam Dibba for a Dibba Dhow Cruise. Head back to Dubai after breakfast. On the way to Dubai, visit two cities in the Northern part of the UAE, namely Sharjah and Ajman. The tour begins with a visit to Ajman, a city of the scenic beauty of the Ajman beach, as well as the cultural and unique artifacts displayed in the Ajman museum. Following this, head off to Sharjah, commonly known as the cultural capital of the Emirates. The major attractions here include Qanat Al Qasba, King Faisal Mosque, Central Souk, Sharjah Corniche, and several others. Accommodation: Radisson Blu, Deira Creek or Similar. Activities included today: Travel by road from Oman to Dubai. On the way stop at the Cities of Sharjah and Ajman. Kick start the day with breakfast, followed by the Dubai city tour. The tour introduces both the new and old parts of Dubai. 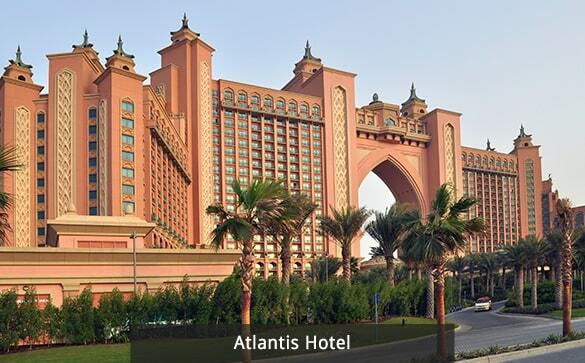 It commences with the new environs of Dubai at the world-renowned Atlantis hotel located at the Palm Jumeirah, a human-made island which can be spotted from space. 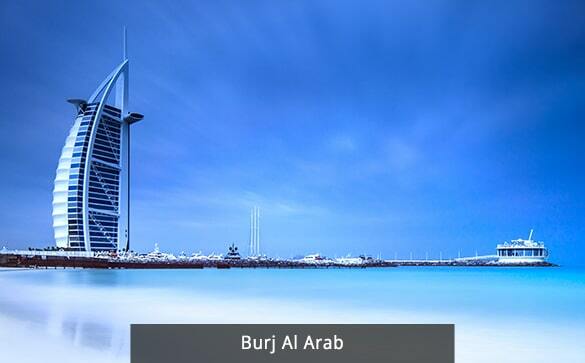 Pass through one of the only 7-star hotels in the world, the Burj Al Arab. Moving ahead, stop at the exquisite Jumeirah Mosque, a cultural landmark of Dubai. Also visit at the Union House, where the treaty that formed the United Arab Emirates was signed in 1971. Finally, head to Downtown Dubai, where numerous world records are located - the largest mall, the Dubai Mall; the tallest building, the Burj Khalifa; the tallest and grandest dancing fountains; and the most significant aquarium in the world. 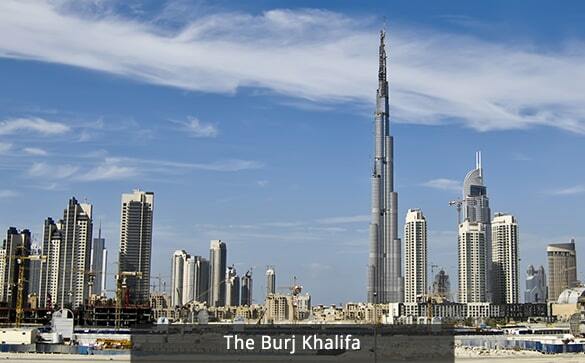 Experience the best view in the city of Dubai from the 124th floor of Burj Khalifa. Head back to the hotel. Activities included today: Dubai City Tour. Visit 124th floor of Burj Khalifa. 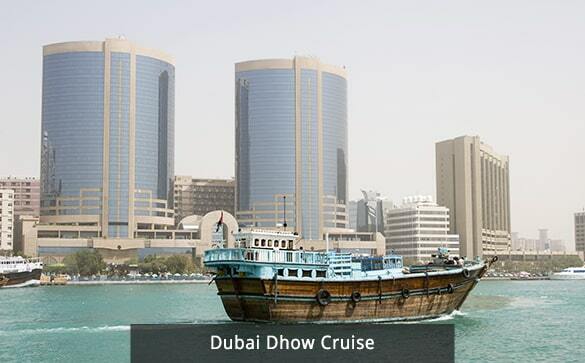 By 7:00 pm get ready for the dhow cruise. Discover true beauty in Dubai while on a traditionally decorated cabin cruise, a wooden dhow, as it sails along the Creek under the moonlight. The significant landmarks shine through the sky as the wooden vessel slips silently across the creek. The past and present architecture of the area is brought to its full beauty, including the National Bank of Dubai, Dubai Chamber of Commerce, Sheikh Saeed's house, and the Heritage Village. This unforgettable evening cruise includes a buffet dinner of either continental or oriental cuisine, along with soft drinks and traditional coffee. 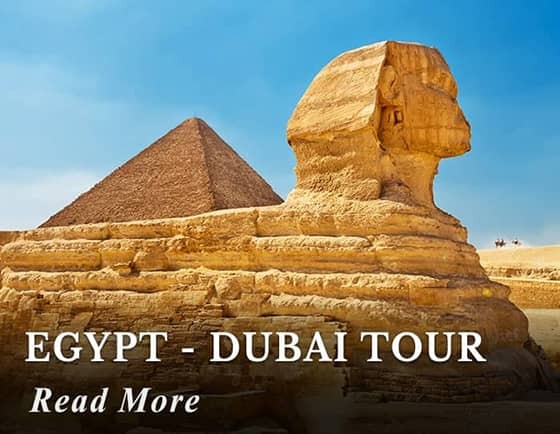 The tour also contains various sorts of entertainment, such as a magic show, belly dancing, and traditional Arabic music. Alcohol is also available on request (at an extra cost). Meals included today: Breakfast and Dinner. Activities included today: Traditional Dhow Cruise with Dinner. Breakfast at your Hotel. Enjoy a relaxing morning. Leave the hotel at 3.00pm for a Desert Safari. A trip to the desert offers a real adventure into the golden sands of the Emirates. The safari will ride through the heart of the desert and will provide the excitement of a roller-coaster, up and down the dunes. A stop for a breathtaking view of the endless desert will give an opportunity to watch the sunset over this tranquil scenery. Reach the camp shortly after and board on the 'ship of the desert' to enjoy the contrast of a desert night. Gain a unique insight into the traditional life of the Bedouins. Dress in a traditional Arabic outfit, enjoy Arabic sweets, try the 'hubbly-bubbly,' apply henna painting and learn about the role that falcons play in local life. A delicious BBQ dinner with grilled specialties cooked on site will be provided, with a choice between a variety of appetizers, salads, and sweets. Finally, try dancing with a belly dancer to the rhythm of Arabic drums. Return to the hotel approximately by 9.30pm. Activities included today: Desert Safari with Dinner. Our Representative will assist you with transfer to the Airport for your return flight. 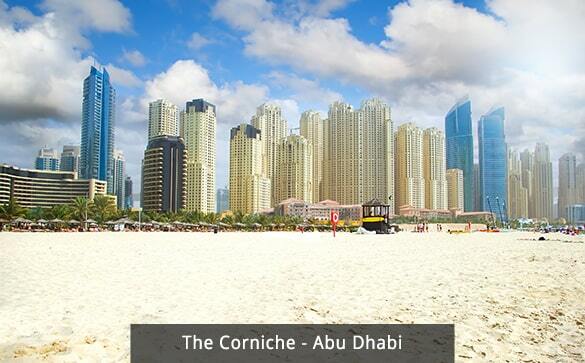 Three Nights of Accommodation at Ramada Corniche, Wyndham Hotel or Similar, Abu Dhabi. Two nights of Accommodation at Golden Tulip Hotel, or Similar, Oman. Four Nights of Accommodation at Radisson Blu Deira Creek or Similar, Dubai. Abu Dhabi City Tour includes visits to the Grand Mosque, Corniche and Marina Mall. Visit Ferrari World includes general admission entrance tickets. Visit Musandam Dibba in Oman; includes Dibba Dhow Cruise. Visit the Cities of Ajman and Sharjah in the Northern part of UAE. Burj Khalifa 124th floor entrance tickets non-peak hours. Desert safari with BBQ dinner. Lunch on your Oman Dibba Dhow Cruise. 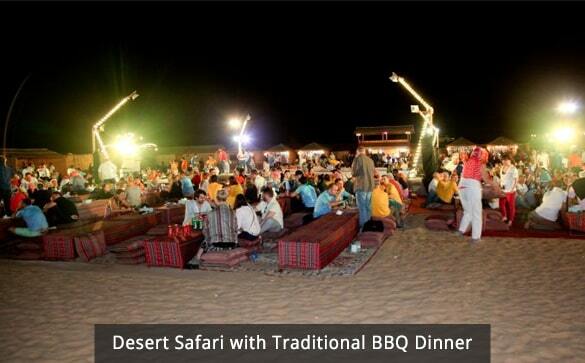 Dinner on your Dubai Desert Safari. Dinner on your Dubai Dhow Cruise. Road Transfers Dubai - Abu Dhabi - Dubai. Road Transfers Abu Dhabi - Oman - Abu Dhabi. All taxes (except Local Tourist Fee). Customary tips to driver, guides, etc. Tourist Fee of 15 Dirham per room per night approx USD 5, paid locally.